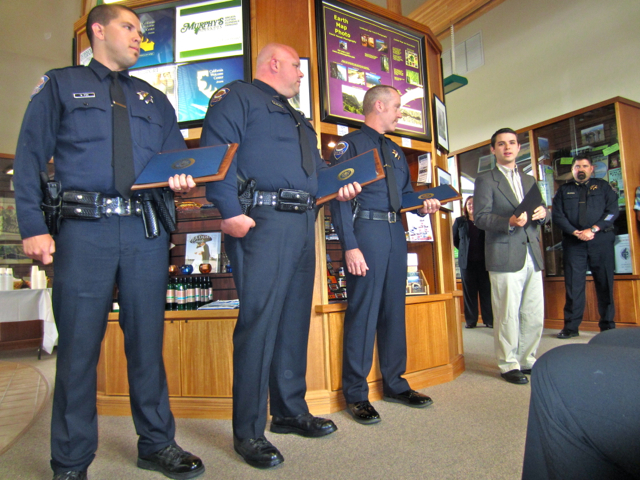 ARCATA – Three Arcata Police officers were commended last week for risking their lives to save others. On Feb. 2, Sgt. Todd Dokweiler happened to be filling in for another officer on a graveyard patrol shift and just by chance, drove up F Street at about 2:30 a.m. There he noticed flames erupting from the lower levels of the Tea Garden apartments and threatening dwelling units above. Dokweiler called for police and fire backup, activated his siren to awaken residents and awakened residents on the second and third floors. Two of the residents were female Humboldt State students who were attempting to climb down from a third floor balcony. To save them, Dokweiler climbed atop a retaining wall near the sidewalk and stretched himself over a 15-foot drop to a second floor balcony. The women were able to clamber down from the burning building across Dokweiler, using his body as a ladder. On July 8, police were called to the 900 block of Sixth Street, where distraught citizen Calvin Martin was attempting suicide by self-immolation. Soaked in gasoline, Martin was attempting to light himself on fire. Officers Brandon Fox and Brian Hoffman then took up station on opposite sides of Martin. Risking harm to themselves, Fox engaged Martin in conversation, stalling his ignition, while Hoffman crept up on him. At the right moment, Hoffman was able to pounce on Martin and wrest the lighter from him. Police Chief Tom Chapman called the three officers “awesome” and said that it is a pleasure to serve with officers of their caliber. Also offering encomiums were John Driscoll, representing Rep. Mike Thompson, and Arcata Chamber of Commerce President Jeff Schmitt. Especially grateful was Calvin Martin, who survived to celebrate his 59th birthday last Sunday. He said he is doing “reasonably well,” and hopes to express his appreciation to Fox and Hoffman personally. “Next time I see them, I’m going to have to treat them to a donut and coffee,” he said. This entry was posted on Wednesday, August 3rd, 2011 at 11:47 am	and is filed under News. You can follow any responses to this entry through the RSS 2.0 feed.